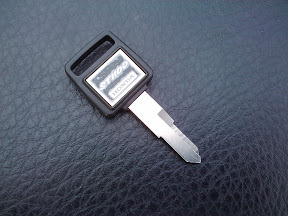 After almost half a million kilometres, I have finally made a copy of one of my ST keys. I haven't lost one, thank goodness. But I have come close. Twice in the last month the key has dropped off the place I keep it, forcing me to retrace my steps looking for it. Both times I was successful in locating it. The following photo shows where I normally hang it on my jacket. I like putting it there, because if I get all geared up and forget to put the key in the ignition, it is easy to get to with gloves on. 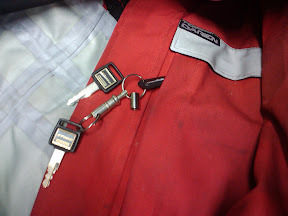 I thought about just getting another key coupler, but I think I will just put it in my pocket. I knew I had to do something, as the key I have been using is hardly worn. I would not want to lose it. When I got the bike, I always used the same key in the ignition, for over 400,000 kms. (Let's call it key1). Eventually it had a lot of wear on it and it began to be difficult to turn on the ignition using it. I started using the key I always carried as backup in my pocket. (Let's call it key2). That key works very well and has little wear. It is this key I almost lost. Here are key1 and key2 together. Key1 has noticeable wear. Obviously I can't risk losing key2. 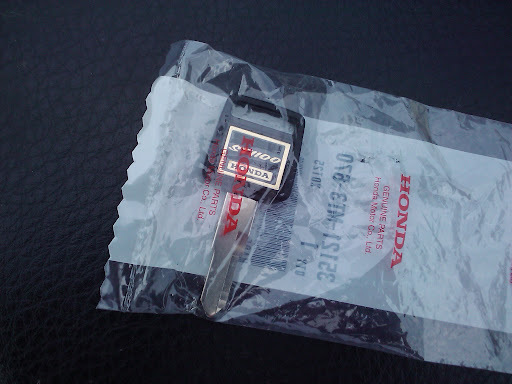 So today I picked up a brand new key blank from Forest City Honda. The new key was cut from my good key, and works well. 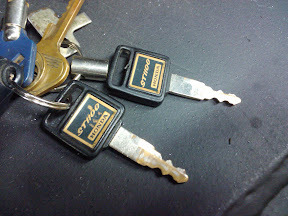 It is now time to retire key2 to a drawer at home. I will use the new copy daily, and use my old key1 as a backup in my pocket. I will feel much safer.